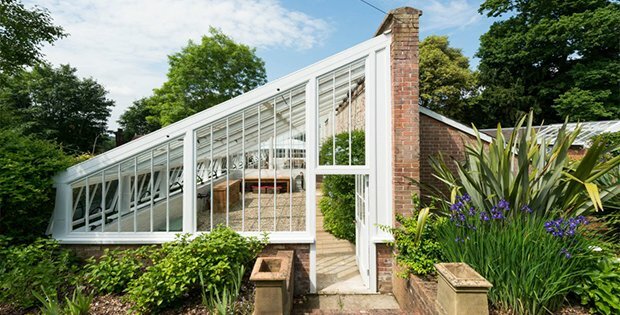 Greenhouse Living: Join the Fun! 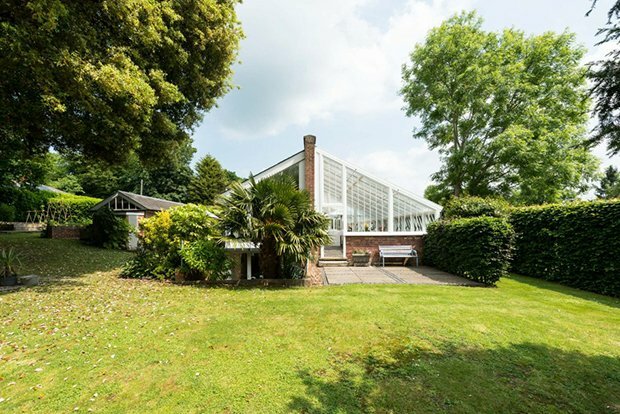 Found in the historic Kent village of Hawkhurst, this long glass building used to be the principal greenhouse of the Lillesden Estate around the mid 19th century. 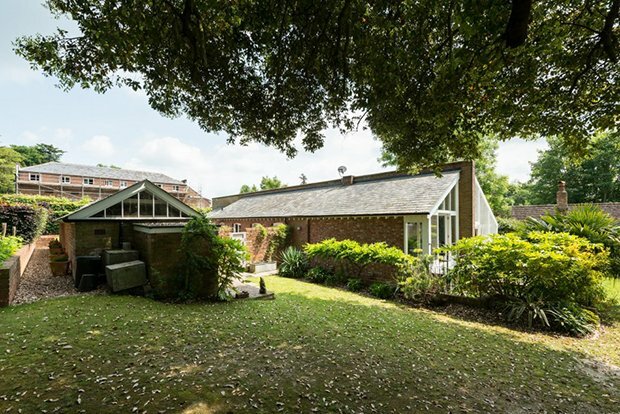 It has since been lovingly converted into a two-bedroom house by Peter Leonard and is now a conservation area surrounded by natural beauty. 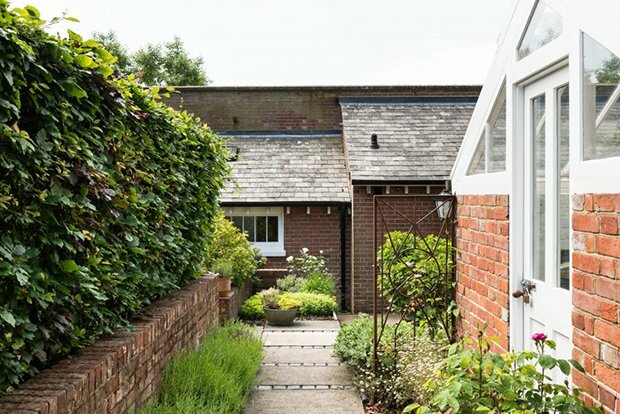 The house is comprised of one main building with two floors, and a separate building that can be used as a studio, work space, storage or additional accommodation. You enter the property greeted by lush greenery in the courtyard leading to an entrance hall. Inside the house you will find the bedroom with an en suite bathroom in the east. On the other side, you have the kitchen and dining area featuring under floor heating, some limed oak floors, and beautiful Corian work surfaces. The steps will take you up to a bright and cozy living room with a couch, book shelves, and tasteful art decor. Another set of steps lead to the second bedroom complete with an en suite bathroom and storage units. You’ll find glazed doors that take you to a stunning sunken garden. 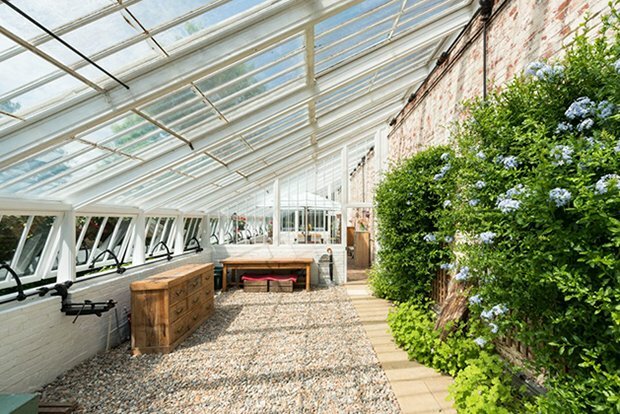 The southern part of the house has the estate’s original greenhouse, restored and fitted with new lights and reclaimed brick flooring. Around the property you will find several gardens. 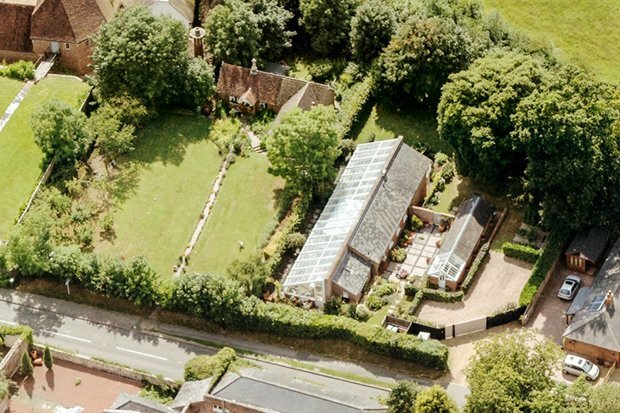 A lawn on the west, a courtyard garden to the north, another lawn east, and a beautiful flower walk complete with arches and trees to the south. Take a look at these photos and tell us what you think on our Facebook Page! 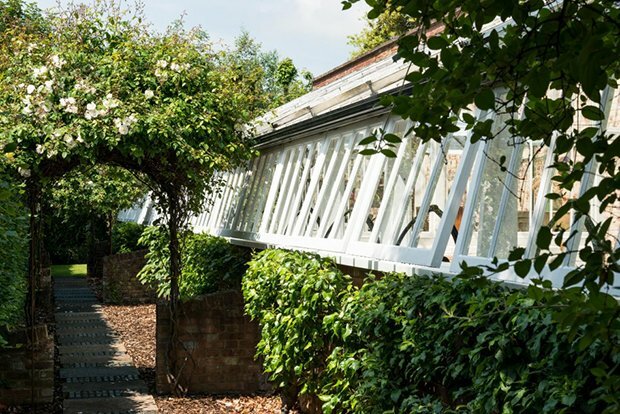 The building was formerly the principal greenhouse of the Lillesden Estate, a large estate originally owned by the banker Edward Lloyd in the mid 19th century. Although not listed itself, there are number of listed buildings nearby that form part of the old estate. It is now a Conservation Area and an Area of Outstanding Natural Beauty. ….TO SEE INTERIORS, CONTINUE TO PAGE 2….